If you are coming in to Trieste by rail, train, boat or landing at the Friuli Venezia Giulia Airport there are many ski resorts within easy reach that can provide you with the perfect holiday. This is a list of the top 5, chosen because they present the best trails and services for skiers of all levels so the whole family can enjoy the trip. By all accounts Berg im Drautal seems too small to make a list of the best ski resorts near Trieste, but what puts it at the number one spot is the experience of skiing that it offers. Unlike Forstau which made the list for its unique use of limited trail space, Berg im Drautal makes it for offering skiers a chance to experience their sport as it used to be. Take away the miles of trails, ski resort areas built on broad mountain tops and snowparks – and you have the serene danger of this resort. It does boast a good beginner and intermediate trail, but it also has an expert slope. The scant 12kms of trail drop an astonishing 550 meters. There are 5 cable car rides to get you to the top, but getting down is the challenge. This can be the best place to go and focus on the art of skiing, while enjoying everything that a traditional ski village has to offer. Berg im Drautal is located in Austria, in Carpinthia, but getting there from Trieste is the fastest and easiest access. Once you are there the small village offers solid accommodations and food, but is lighter on the clubbing, partying and shopping found at other resorts. This is a gentleman’s town and an adventurers slope. It is also ideal for families trying to teach their children the love of winter sports without the love of winter merchandise too. Forstau may be the smallest ski resort area on this list, but it made it because it is the largest when it comes to providing a perfect experience for families and those wishing to enjoy the slopes in a calmer and more relaxed environment. With only 12km of slope, Forstau has over 7 of them dedicated to the beginner. There are some basic intermediate trails that more than satisfy but the real emphasis here is on building the love of skiing. The beginner slopes have several special amenities right on them that are rare to find anywhere else. On the beginner slopes you will find ski huts for warming while out. This can help to make the experience more enjoyable for children. The short reach of the pistas means you are never far away from your accommodations, which is another bonus. It is the special themed ski trails here that will capture the young imagination. They have themed trails with animals set along the way, an Indian themed trail and even a Viking one too. If you are seeking a family experience with the emphasis on the family, this can be the ideal choice for your skiing vacation. Kals is located in Tyol in Austria, but is also near enough to Carinthia to be easily accessed with a Trieste car hire to Austria deal. Climbing high up into the Alps one can begin to understand why the first thing that skiers mention loving about this ski area is that the chair lifts have heated seats. The 1000m ride to the alpine pistas is beautiful. The sail down on your skis can take numerous forms with the Kals having pistas that are perfect for all abilities. They even have dedicated toboggan runs and a cross country run that descends 3,500 metres. The emphasis at Kals is on keeping everyone as busy and happy as possible. There are many winter sporting activities here that range from the competitive to the sheer enjoyment of sledding. Many of the sports are also offered under the lights so activities can go one well into the night. While there is a h2 summer crowd, this area has always been a favourite of skiers and winter holiday goers so the village is well prepared to provide anything that you need. Located in Carinthia this ski resort crosses the borders of Austria and Italy, allowing you to take the benefit of both. The attraction isn’t so much the views but the micro-climate of the area. Carinthia enjoys some of the most secure days of snow of all the resorts and fresh pack holds well. You won’t have much to deal with on the trails as the Nassfeld Hermagor rates high with skiers for responsiveness and maintenance. 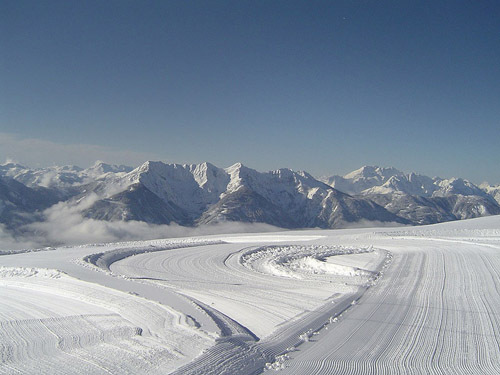 They have 110 km of pistes that can accommodate skiers of all styles and levels. There is a special 7.6 km straight run into the village, as well as a lit slope for night sking too. Snowboarders and free style skiers will love the challenge of the snowparks and obstacles that have been constructed here as well. 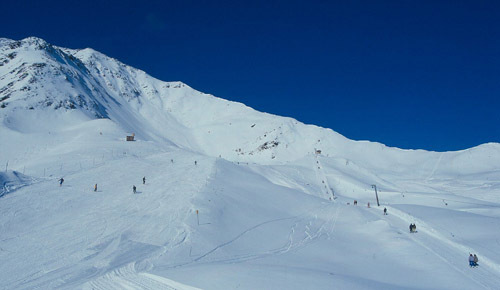 Nassfeld Hermagor has been consistently placed in the top 10 of the ski resorts in the Treiste area. Not only are the pistas fun and challenging, but the ski village has everything that you want. It hasn’t given itself over to absolute tourism so there is still old world charm to be had. The accommodations are good, the nightly entertainment fun, and there is much to do in town when you are taking a recovery day from the slopes. While you can approach the village from either country, visitors say that the food is better on the Trieste side, and Trieste itself is accessible as a day journey too. 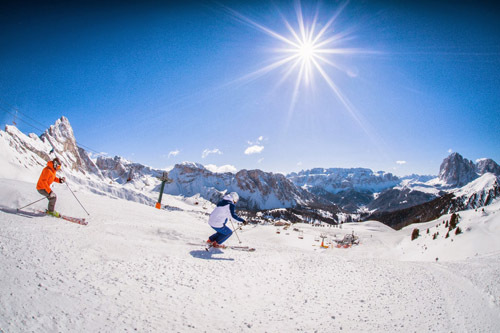 Dolomiti Superski lets you experience the best of the Domolmite Alps no matter what kind of vacation you are having. They have a whole plan for those sking with families and children that makes sure that everyone has a good time. From lessons to rentals to special children’s pricing on day passes and more – this ski resort ranks very high with their beginners slopes. If you want more of a challenge, there are over 1200 km of skiing trails and 460 lifts. The trails range from beginner to expert and all are classed well in reviews. The past few decades have seen more snowparks and freestyle trails put in place at the Superski so no matter what your style you will have a trail just for you. One of the main advantages of the Dolomiti Superski is the ability of the resort to provide for all types of skiing parties. You can make special arrangements for your parties or events, receive special price reductions and create custom package tours as well. There are many different options for accommodations and the ski village offers great food, entertainment and shopping for your off slope hours. You can even enter in one of the many amateur competitions they hold in the numerous winter sports, or be a spectator and still enjoy the fun.